J&S Studies Inc. opened in 1985 and is independently owned. 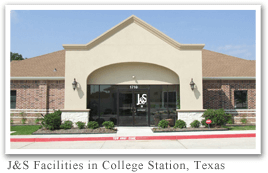 Located in College Station, Texas, near Texas A&M University with an enrollment of 48,000 plus we offer rapid study enrollment, the ability to use a central IRB, a large database of patients, and a commercial airport serviced by American and Continental Airlines. We are staffed with dedicated and well-trained study coordinators and are open during flexible hours, including evenings and weekends as needed. J&S Studies has conducted over 400 clinical trials in Pharmacokinetic Studies; Phase I Dermatology; Phase II-IV Allergy/Immunology, Dermatology, ENT, Family Medicine,Gynecology, Infectious Diseases, Internal Medicine, OTC Product Testing, Provocative Heartburn, Pain Management and Healthy Volunteer Studies.